Today, it is Autumn and the hills are breathtaking in their Autumnal finery. Gold, red, copper and brown leaves are everywhere. It brings out the kid in me, all I want to do is jump and roll. 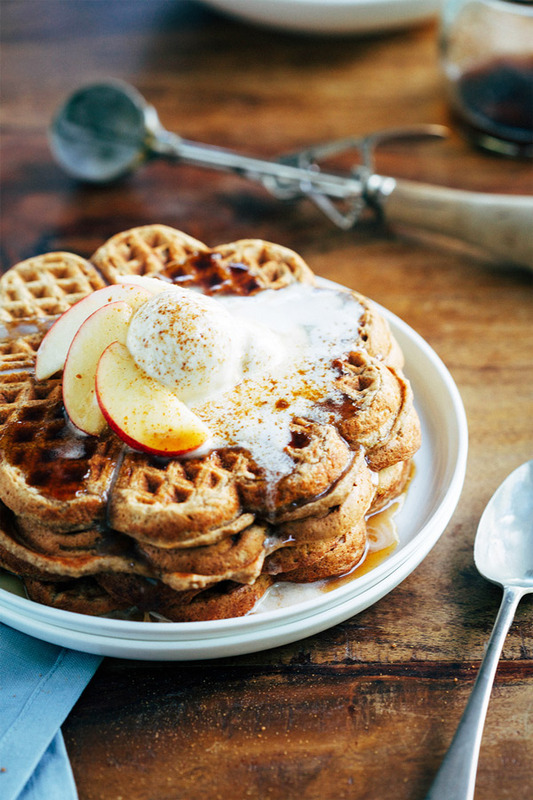 And it’s apple season what’s more so what better way to celebrate than with Spiced Apple Pie Waffles. I’ve never been much of a waffle-eater. We are more pancake people in Australia. And fritters. We are big on fritters. Recently, however, I bought a waffle iron and I am officially a convert. Crispy on the outside, soft on the inside and drizzled with maple. What is not to love? Well, you do have to buy a waffle iron if you don’t have one already and me thinks that might include most Australian families (or have I been living in a waffle-free bubble on my own?). So perhaps there is a little something not to love. However, waffle irons are pretty cheap and the waffle itself is seriously versatile. I have plied my little family with various sweet concoctions and of course I have stashed many a vegetable in the batter. The waffle iron is my latest weapon in a growing artillery of tools designed to get the elf to eat vegetables. But not today. 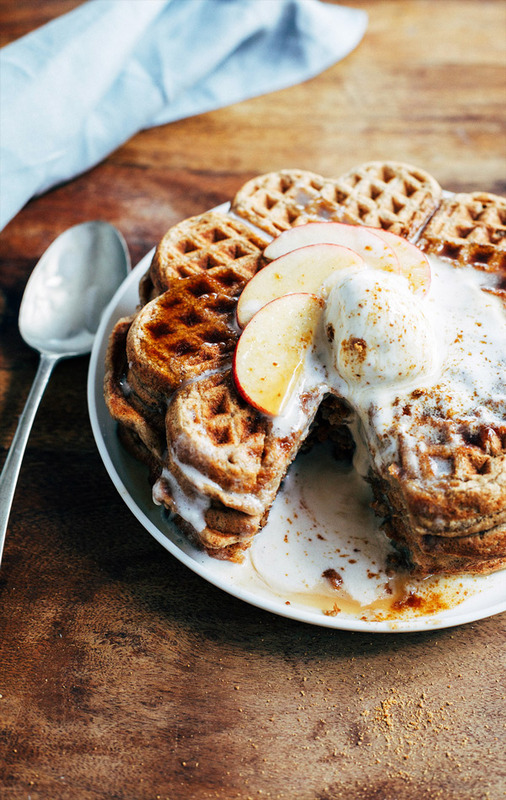 While these spiced apple pie waffles are inspired by Autumn, they would work all year round; the same way ice-cream works at night in the dead of Winter. I don’t understand the science, I just know it works. Ice-cream is chemically proven to take the chill out of Winter. This is especially true if the ice-cream is served with chocolate sauce. True story. 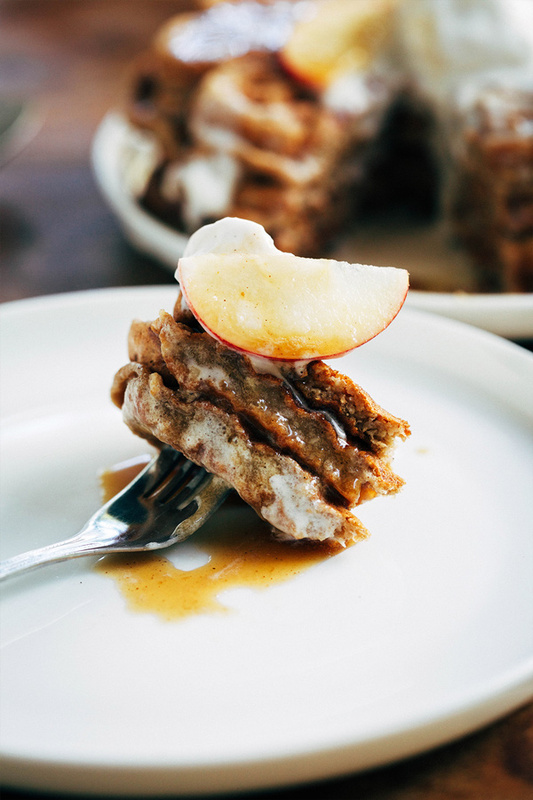 If you were inclined, and I would be, spiced apple pie waffles would be wonderful in colder months with a spoon of just-cooked spiced apples or perhaps a drizzle of spiced caramel sauce. Today however, I simply sliced delicious and crunchy Red Gala apples and scattered them over the top. I love the crunch and slightly acidic sweetness the apples add. 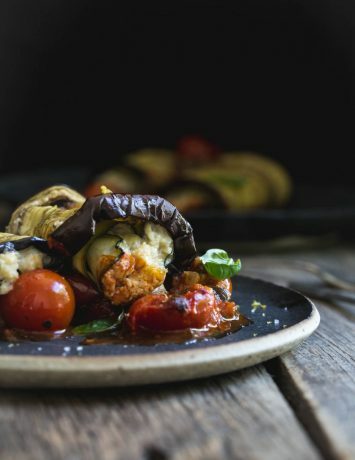 While everything is tastier in-season, this recipe doesn’t call for apples to be in their prime. I use apple sauce in the waffle batter and apple juice in the syrup. Have I mentioned the syrup? No? The syrup is compulsory. 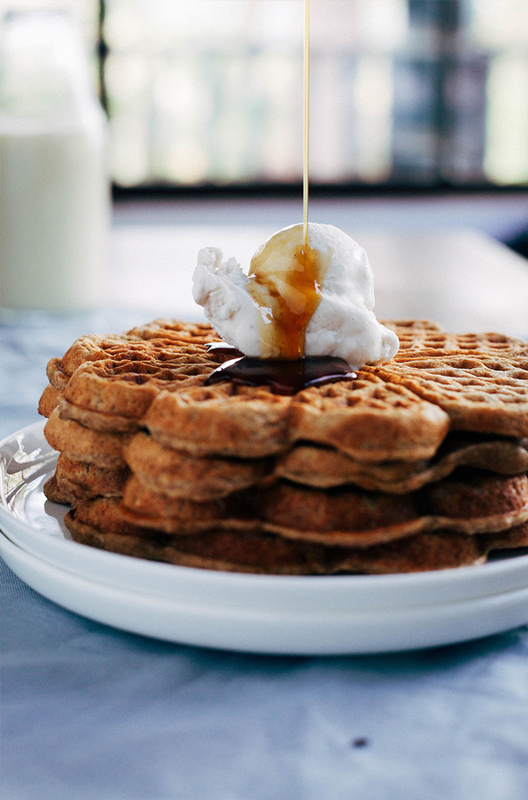 The waffles have a hint of spice but the syrup…the syrup is where the “pie” comes together. Cinnamon, apple juice and a tiny pinch of ginger warmed together with maple. 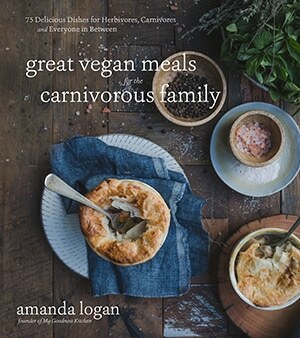 I serve mine with coconut ice-cream and fight the dog to lick to the plate. Another true story. Enjoy, x. In a small saucepan, combine syrup ingredients and gently heat for around 3 minutes. Remove and set aside. Stir flaxseed powder and water together in a small bowl to make a flax egg. Sift flours, cornflour and baking powder in to a bowl. In a separate bowl whisk together the apple sauce, vanilla, coconut, sunflower oil, almond or soy milk, cinnamon, sugar, flax egg and salt until combined. Add the wet ingredients to the dry and fold until just combined. Don't overwork the batter. Less is more. Allow the batter to sit for 5 minutes. Turn on the waffle iron to heat. Turn the oven on to a low heat. Spoon the batter in to the waffle iron in batches and cook for approximately 5 - 7 minutes or until the waffles are slightly crispy. Keep the waffles warm in the oven while you finish cooking all the batter. Serve with a good drizzle of spiced maple, coconut ice-cream and sliced apple. Sprinkle with nuts and/or coconut if desired. These look amazing Logan. Seeing your photos reminded me of my love for waffles. And when they are made with pure ingredients they are energizing and guiltless! Thanks so much Ashley, I love waffles too! You have reminded me to make more. 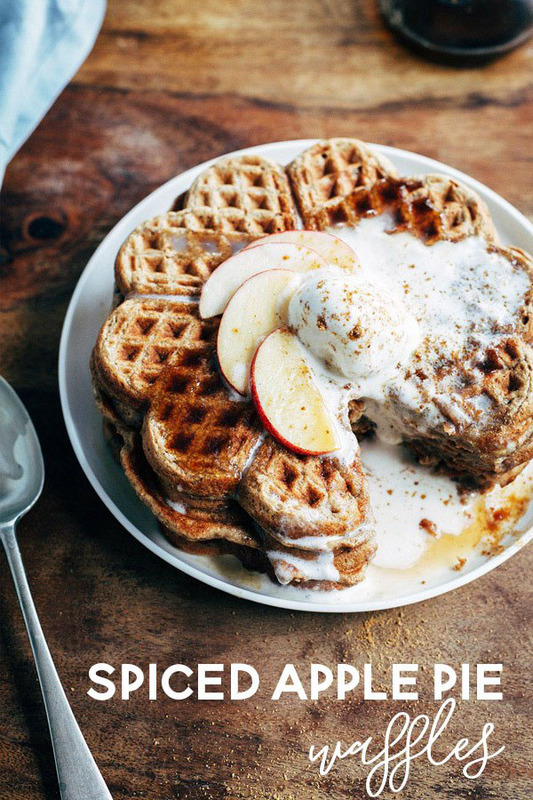 wow…waffles and ice cream. What a happy day 🙂 Nice pic ! Thanks Amallia! Thanks for visiting. These waffles are a work of art and coconut ice cream SOLD! I will be trying these soon! Thanks Michelle, I love these waffles too. Let me know if you make them! Cheers, A.
Ahhhh someone hand me a damn waffle maker already! 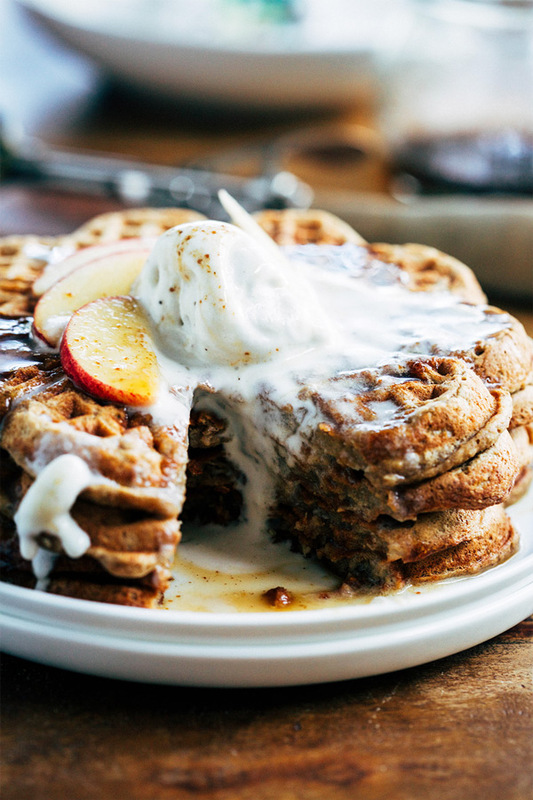 These waffles are seriously everything Amanda. WOW! Thanks Meg. I have to say, I enjoyed the recipe testing IMMENSELY!